Day 5: I head out with the Captain as he bikes to the dentist (for what turns out to be a root canal) and I continue on to Joann's Fabric (more duck canvas & flag supplies while they're on sale). Upon return, The Captain takes it easy, but manages to hem a few rolls of trim. First Mate makes a bolster pillow that cleverly conceals a fleece blanket. Day 6: First Mate hops on the machine because The Captain doesn't have anything he can sew today (doesn't want to remove the windshields because it's supposed to storm on & off all day). Before I can cut out and sew the first seam, I'm booted. He's on a roll! 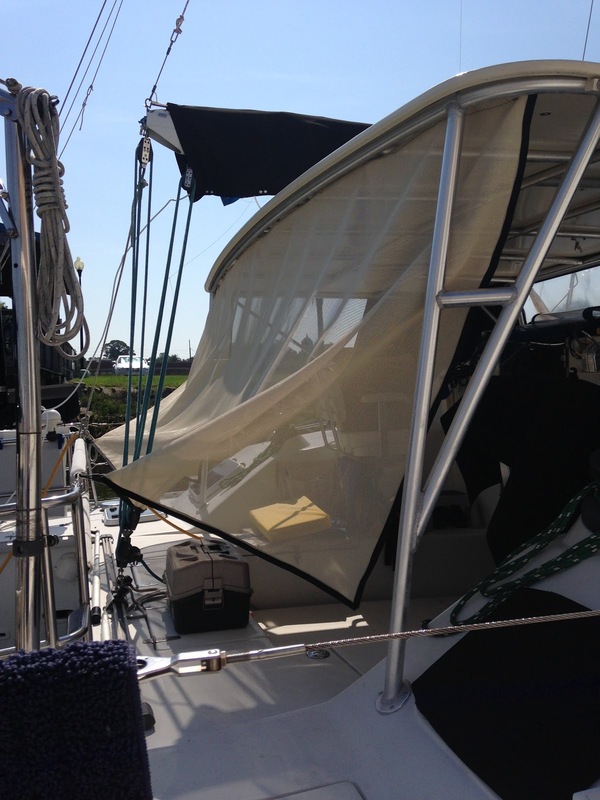 He sews the starboard center windshield piece and then puts a hem on our sun cloth with 1 1/2" webbing. 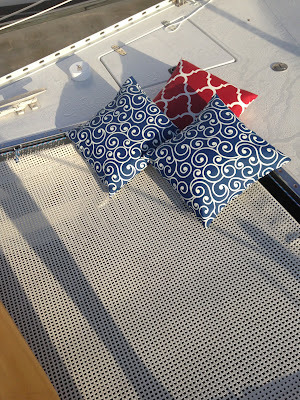 First Mate completes a second bolster pillow for the salon (stuffed with spare towels). "The plastic is here! The plastic is here!" Day 7: Plastic arrives! It's quickly traced and cut (too quick. I feel nauseous!). It's easier to sew with two people, one holding the weight and the second sitting at the machine. It takes most of the day to do the initial hem, then exterior trim, interior trim and zipper (first casualty. 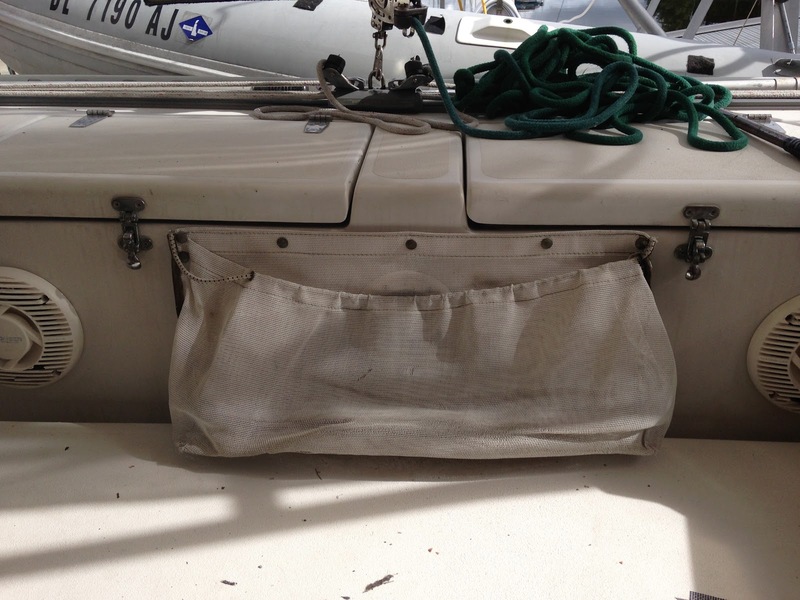 First Mate orders another zipper). 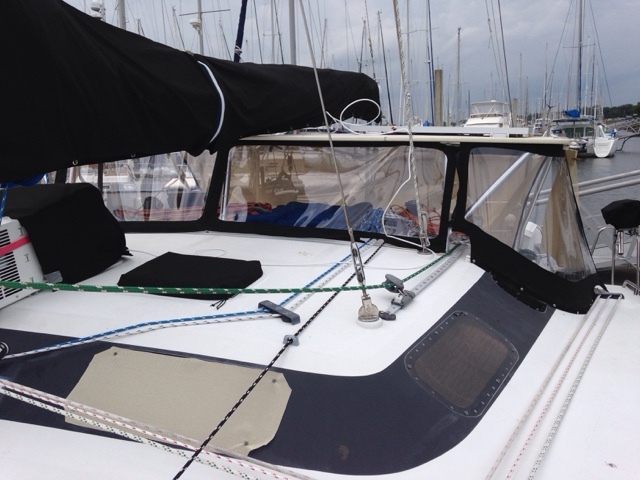 Starboard side temporarily in place by sunset. (The wrong dacron leech line was shipped, so no hatch covers for the First Mate until next week). First Mate's side. Looking good! Day 8: Repeat of yesterday. 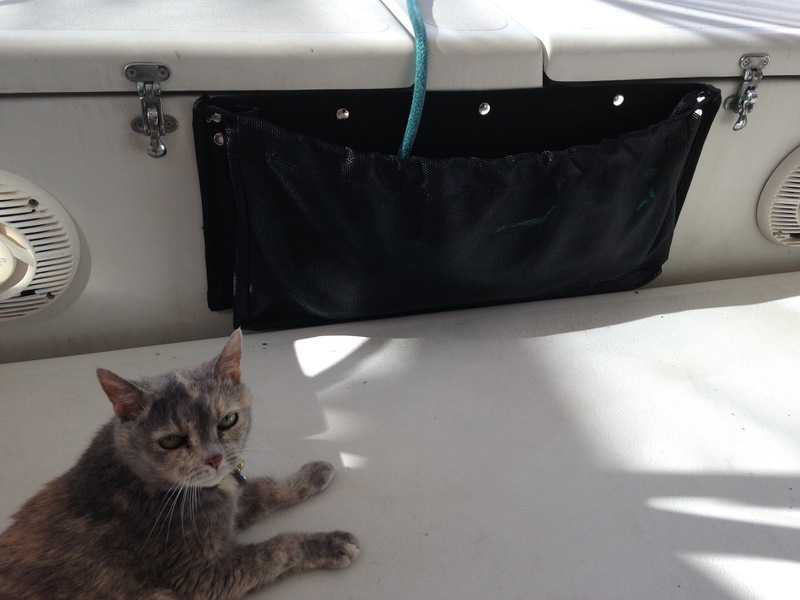 The Captain spends the morning, securing the starboard piece then moves to the port side plastic. (We ride our bikes less than 1/2 mile to the pub in town for lunch. Neighbors ask if we got our exercise. "If you consider riding a 1/2 a mile to eat a cheeseburger EXERCISE?!") Again, temporarily in place by sunset. 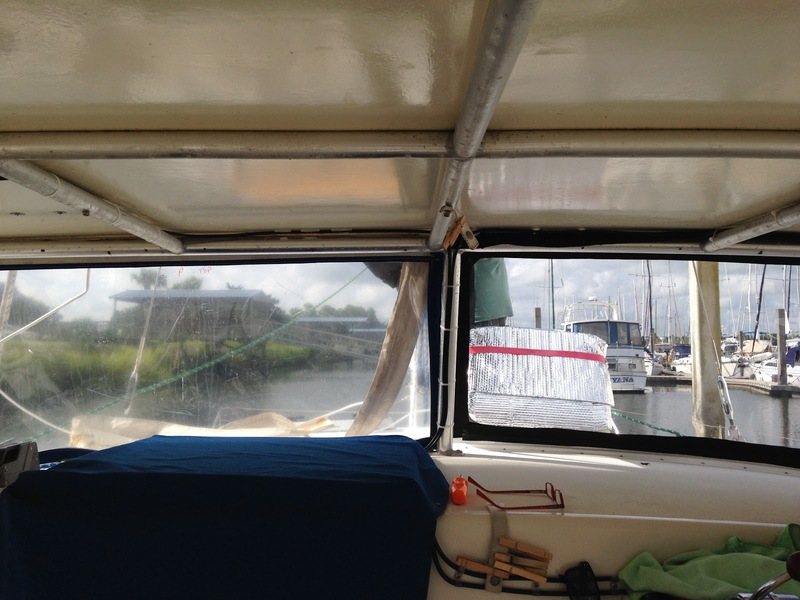 Day 9: Starboard windshield in place! I sat in the cockpit as he put it up, and immediately saw a flaw in the plastic right at eye level. Did we do that? We tried polishing it with the new cleaner. "Maybe it will be better after it sits in the sun for awhile?" Nope. The Captain will roll out more of this roll tomorrow and discover the flaw is throughout the roll. It's going to drive us crazy. A call into Sailrite. Meanwhile, work stops on the dodger. Day 10: The Captain moves back to the main sail cover. He successfully sews the first zipper, but somehow ruins his second zipper. "I'm done for the day." Harry Potter marathon. 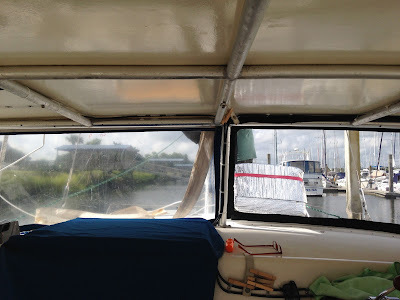 Day 11: After breakfast, I head out for a walk/grocery store run as the Captain starts the last piece of the dodger/windshield for the First Mate's side. This is either the easy part or the tricky part. It has to zip on 3 sides, SO it will be modified from the original to make that happen. 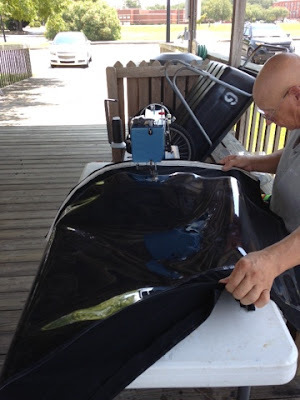 As mentioned above, the Captain rolls out more plastic to cut the last piece of the dodger/windshield and sees the flaw repeated throughout the roll. He could turn it sideways, but then he won't have enough for the side extensions he was going to fabricate. Work on the dodger stops & I call Sailrite. 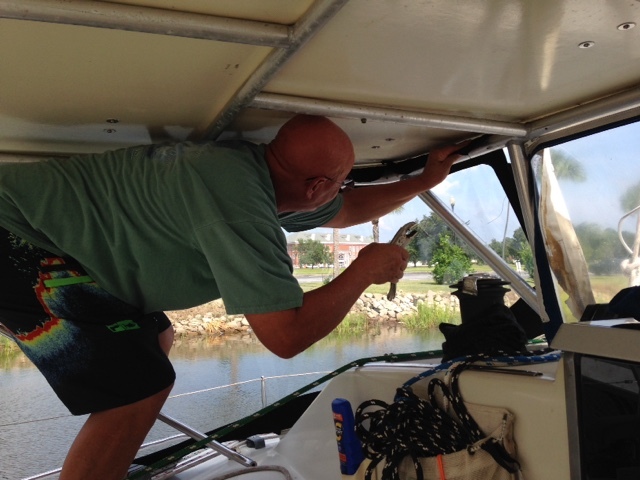 Day 12: First Mate is assigned to clean and polish the new "strataglass". First, I have to ride to West Marine and purchase it. Dang it! (I dawdle on the way back, stopping a the coffee shop for an ice coffee & cranberry muffin for the Captain, then a swing through the new-used bookshop). The Captain has two of the three zippers on the First Mate's front windshield (he's modified it to be permanently affixed at the top, since we usually fold it in and snap it up). 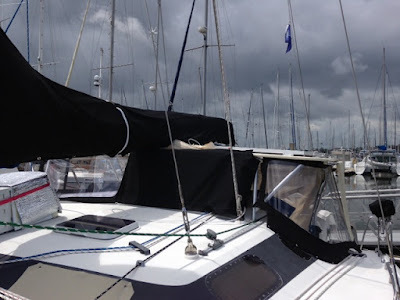 The Captain is still contemplating this windshield piece, so we go to the clubhouse to watch the final stages of the Tour de France (First Mate squeezes in some laundry). 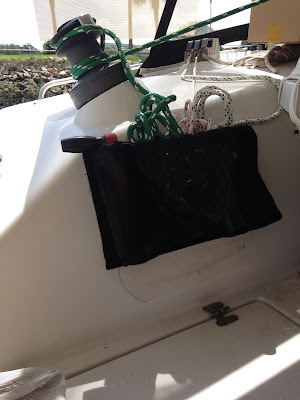 Day 13 & 14: There's a side trip into sheet bags using black Phifertex with leftover plastic to reinforce the back. 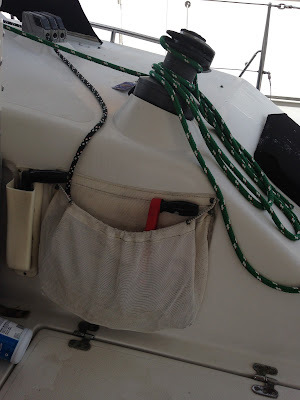 The Captain stays with the same basic bag so he doesn't have to redo the snaps, but does some refinements. First the traveler sheet bag, then the port winch sheet bag with a separate slot for the winch handle. Each one takes him a good half day, which resulted in a lot of head scratching & then a log nap. He stopped short of saying it made his head hurt, but "more thinking than I want to do in one day." He runs out of Phifertex. 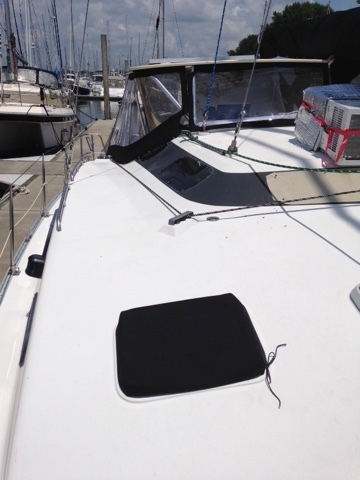 Day 15: Copilot calls first shift on the sewing machine & cranks out 3 hatch covers. Getting faster! 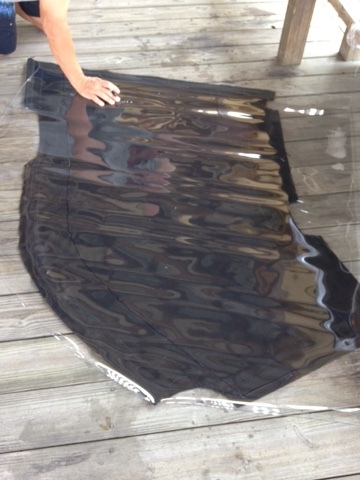 Day 16: We didn't receive any help from Sailrite about the flawed plastic. They said to leave it out in the sun a few days. That made it harder to see, but it's still there and will probably drive us crazy--especially because of how much we paid for that roll! (If we'd known, the flaw could have gone in the side pieces instead of the front. At least it will be "up" most of the time.) 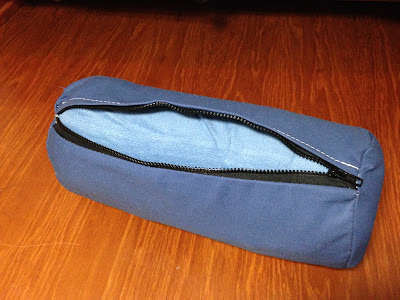 Finally, the Copilots plastic is up, but The Captain runs out of Tenara thread before he can get the last zipper on. Dang it. We're 7/8 done (main sail cover zipper, one dodger/windshield zipper, 2 sheet bags to go). Wow, you guys are amazing with all the cool stuff you have made! Looking great.